The first numbered tractors in the John Deere line, the 50 and 60, arrived in 1952 as replacements for the “B” and “A” respectively. Both represented broad improvements in performance and convenience. 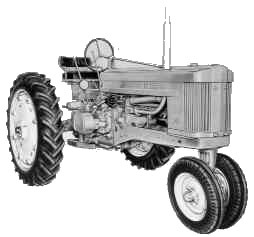 These were the first tractors with duplex carburetion (a separate carburetor for each cylinder ) to meter fuel precisely for improved fuel efficiency and increased horsepower. These were the first John Deere Tractors with a “live” powershaft, which provided continuous power for operating PTO-driven equipment whenever the tractor engine was running. “Live” high-pressure Powr-Trol on the 50 and 60 further enhanced the already enviable reputation of John Deere hydraulic systems. It provided increased hydraulic power to handle heavier drawn or integral equipment and operated independently of both the transmission clutch and power takeoff. Convenience features included an improved steering system, adjustable backrest on the seat, longer hand clutch and throttle levers to put these controls within easier reach of the operator. The air intake stack was under the hood, and the exhaust stack was offset on the hood to improve straight-ahead visibility. Changing rear wheel tread became a quick and easy operation with a significant industry first–rack-and-pinion rear wheel tread adjustment. Introduced on the 50 and 60, it remains on the most modern John Deere Tractors today. The 50 was originally rated at 20.62 drawbar hp and 26.32 belt hp.